Analogue Productions Ultra Tape reel-to-reel reissues! Custom slipcase cover - highest quality tape reissue! From Acoustic Sounds, Inc., the world leader in audiophile music sales, comes the highest quality analog reel-to-reel tape album reissues — Analogue Productions Ultra Tape! 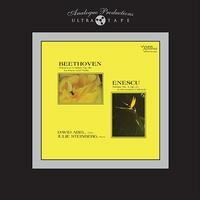 On this recording of Beethoven: Violin Sonata Op.96 & Op. 25 we hear David Abel, violin, Julie Steinberg, piano. This composition occupies a special place among Beethoven's creations because it shows a unique quality: there is an Olympian elegance, a profound gentleness that pervades the entire work. Nowhere does Beethoven the earth shaker appear. Even the scherzo movement does not disturb this sustained thoughtfulness. The second movement, Adagio expressivo, one of Beethoven's floating Adagios, is based on the compulsion of a slow intense bass movement. The serenity of this movement is not disturbed by elaborate decoration from both instruments. And this stillness is further emphasized by a fourteen measure repeating pedal point (nearly one fifth of the movement) which closes it. The Scherzo sustains the serious character of the entire work. The last movement begins not only with a quick alternation of themes between the violin and piano, but a soft and loud alternation, as well, which adds to the feeling of growing intensity. An interrupted rondo is the plan, but the interruptions are of a major kind: another sensuous adagio and a daring fugato lead to a presto outburst concluding the movement. David Wilson had already recorded piano by the time he began working with world-class musicians Steinberg and Abel in the Mills College Concert Hall in Oakland, California, though it was the first time he recorded a violin. Experimenting with different microphone positions in an attempt to capture what he calls the "delicious geometry" of sound emanating from Abel's Guarneri and Steinberg's Hamburg Steinway D, he ended up hanging his Schoeps CMC-36 microphones from a ladder high above the instruments. Of the results, he says, "I'd put the recording up against any chamber music recording. It has to be my favorite." Reached at their home in Oakland, Steinberg and Abel, whose trio with percussionist William Winant has commissioned music from the likes of John Harbison, Lou Harrison, Paul Dresher, Somei Satoh, and Gordon Mumma (for starters), reminisced about their time with Wilson. "The session was free of the time pressure and tension that can really get in the way of the final outcome," says Abel. "If we wanted to stop for a bite, or go outside to rest for a while, that was not a problem... Dave kept open to what was happening in the moment, as in a concert. He understood about not making a 'perfect' recording, and instead left the small imperfections... that make the final result sound human and real. One could not ask for better." The remaining titles include: Rickie Lee Jones' It's Like This / Rachmaninoff's Symphonic Dances (the famous Turnabout recording) / Fritz Reiner and the Chicago Symphony Orchestra's Scheherazade (RCA Living Stereo) / Fritz Reiner and the Chicago Symphony Orchestra's Pines of Rome and Fountains of Rome (RCA Living Stereo) / Leopold Stokowski's Rhapsodies (RCA Living Stereo) / René Leibowitz and the Royal Philharmonic Orchestra The Power of The Orchestra (RCA Living Stereo) / Fritz Reiner and the Chicago Symphony Orchestra's Lieutenant Kije and Stravinksy's Song of the Nightingale (RCA Living Stereo) / Hugh Masekela's Hope / and Lowell Graham's Winds of War & Peace (Wilson Audio).